Gastric bypass works by changing the patient’s anatomy, creating a smaller stomach pouch and rerouting the path that food normally takes so that it “bypasses” a large section of the stomach and a portion of the small intestine. New Jersey Bariatric Center® surgeons perform the gastric bypass procedure laparoscopically through approximately four or five incisions in the abdomen. The surgeons staple off a section of the stomach, leaving the rest of the stomach in place and creating a pouch that can hold about a quarter-cup of food. The small intestine is also divided and connected to the new smaller pouch. Food bypasses the stapled-off section of the stomach and the upper portion of the small intestine. The result is an early sense of fullness and satiety that reduces the desire to eat. Not only do patients who’ve undergone gastric bypass surgery lose weight because they simply cannot eat as much, but they also absorb fewer calories. This dual approach –restrictive (restricts the amount of food) and malabsorption (reduces the amount of calories absorbed)– gives gastric bypass twice the weight-loss punch as other procedures. 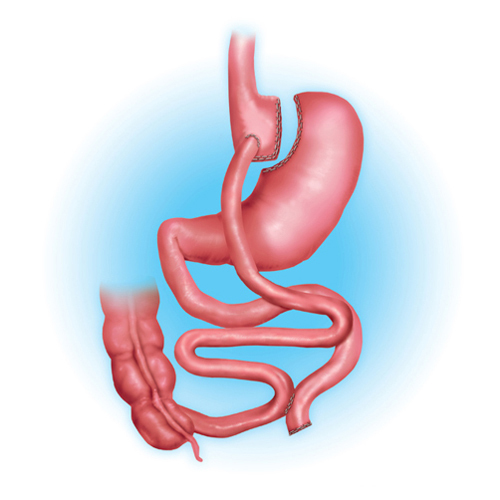 Studies have found numerous health benefits associated with gastric bypass surgery. New Jersey Bariatric Center® patients report an increase in quality of life, including the improvement or resolution of diabetes, high blood pressure and sleep apnea. Read more about the health benefits of weight loss surgery. However, as with any surgery, there are risks. When deciding whether gastric bypass surgery is right for you, the perceived benefits must outweigh the potential risks. To learn more about specific complications of gastric sleeve, visit our Risks page.